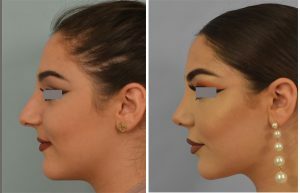 This patient underwent closed rhinoplasty to lower the dorsum (bridge), decrease tip projection, raise and refine the tip, and shorten the nostrils. Nasal deviation was improved. 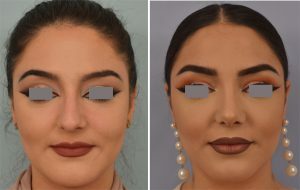 Deviated septum was treated with septoplasty and nasal walls were supported using the patient’s own cartilage to prevent collapse.